Though never taken seriously during his lifetime, and rarely mentioned in Gurdjieffian literature, the name Boris Mouravieff has in recent years become more than a footnote, thanks to a diligent campaign by his latter-day followers. Though he never joined the Work, forever remaining on its periphery, gleaning here and there what information he could, criticizing and casting doubt, Mouravieff was never quite able to get Gurdjieff and the teaching out of his system. 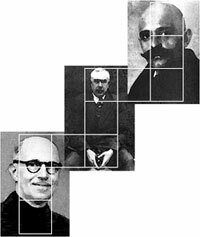 Then in 1961, 12 years after Gurdjieff's death, Mouravieff came forward with a three-volume work, Gnosis, which purported to give what he called "the complete" exposition of the exoteric, mesoteric, and esoteric tradition of Eastern orthodoxy. In fact, it was a direct appropriation of the ideas of The Fourth Way as Gurdjieff had presented them during his Russian period (19121919) and which Ouspensky reported in his book, In Search of the Miraculous. Essentially what Mouravieff did was to strip Gurdjieff's teaching of its mooring in sacred science and insert it into an Eastern Orthodox Christian perspective, adding some peculiarities of his own making. However, there was a glaring problem. The two teachings simply didn't fit together. Eastern Orthodox Christianity was mystical and monastic. The Fourth Way was scientific and rooted in ordinary life. To surmount this, Mouravieff invented what he called "the Fifth Way"a worldly celibacy of platonic courtly love between man and woman, "polar beings" whom he called "The Knight and the Lady of his Dreams." After Mouravieff's death in 1966 his book soon went out of print and the institute he founded in Switzerland, The Centre for Christian Esoteric Studies, came to nothing, closing its doors within two years. What must be recognized is that Mouravieff, never having been one of Gurdjieff's pupils, bases his understanding of the teaching on that of Ouspenskynot Gurdjieff. As such, Mouravieff's understanding can only be intellectual and therefore partial. A refutation would be as unnecessary as it is tiresome were it not for this small band of Mouravieff's contemporary followers who, without providing any credible historical evidence, relying instead on hearsay, Mouravieff's personal conjecture and opinion, as well as other biased sources, have mounted a campaign to: (1) discredit Gurdjieff, (2) deny the authenticity and origin of the teaching as Gurdjieff presented it, and (3) assimilate Mouravieff's "Christianized" Fourth Way into the Eastern Orthodox Church. Given this, it would be well to examine Mouravieff and the phenomenon he represents. We begin by examining Mouravieff's relationship with Gurdjieff and then consider Mouravieff's teaching itself. A Russian refugee of the Bolshevik revolution, Boris Petrovitch Mouravieff was first introduced to Gurdjieff in 1920 in Constantinople by P. D. Ouspensky. (1) Twelve years younger than Ouspensky, Mouravieff, fascinated with the teaching, attended lectures and movements demonstrations, but formed a strong animus toward Gurdjieff. An aristocrat, intellectual and moralist, Mouravieff no doubt had trouble with Gurdjieff's unconventional behavior, his acting and trampling on people's corns, and of course his heavy Caucasian accent, an accent, Ouspensky said, one associated with "anything apart from philosophical ideas." And it was Gurdjieff's way of teaching, whenever anyone reacted to these manifestations, to make them worse to show people their identification. Though Mouravieff was firm in his determination to stay "outside the zone of his [Gurdjieff's] personal influence," he had been "poisoned," as Gurdjieff would say, and could never entirely break away. For even after both men left Constantinople and located in Paris, Mouravieff continued to seek out Gurdjieff at the Café de la Paix and in Fontainebleau. And so when Ouspensky broke with Gurdjieff in 1923 and asked Mouravieff to help with the translation and editing of his book, then titled Fragments of an Unknown Teaching, he gladly agreed. Thereafter, Ouspensky and Mouravieff exchanged many letters on the teaching and whenever Ouspensky visited Paris the two often had dinner together. These letters and meetings, Mouravieff said, "gave me the opportunity to discuss all the elements of the system with him. "(2) Thus, Mouravieff's understanding of the teaching could only have been founded on Ouspensky's understanding, not Gurdjieff's. To understand all of Mouravieff's subsequent thinking and actions, this point is a crucial determinant. Mouravieff apparently never saw it for he makes no defense of it. The reason Ouspensky gave for his break with Gurdjieff was "to save" the teaching. Strangely, he was saving it from the very man who embodied the teaching. Given Mouravieff's judgment of Gurdjieff as "in the image of a fallen angel," he certainly wholeheartedly supported, no doubt encouraged, Ouspensky's break. Though he had agreed to help Ouspensky with the book, obviously wishing to learn as much of the teaching as he could without coming under Gurdjieff's knuckle, Mouravieff was very much against its being published. 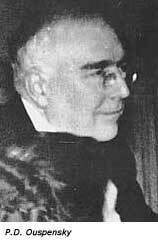 At the last meeting he had with Ouspensky in 1937, Mouravieff strongly argued that Fragments not be published. (3) Wrote Mouravieff, "I was opposed to the publication. It seemed to me that esoteric doctrine, by its very nature, eludes an account described in detail by writing." Apparently, with both Gurdjieff and Ouspensky safely dead, Mouravieff had a radical change of mind. For in 1961 Mouravieff was to repeat the pattern and 'save' the teaching from Ouspensky who had, of course, 'saved' it from Gurdjieff. The confusion and subsequent betrayal that began with Ouspensky now spread to Mouravieff. Mouravieff first published an attack on Gurdjieff and Ouspensky in 1958 in a small magazine (interestingly enough given to the idea, fashionable in modern times, of synthesis), then published his 758-page, three-volume Gnosis, its central ideas lifted directly from Ouspensky's book. First Mouravieff wrapped Gurdjieff's Fourth Way teaching in a heavy Christian religious coating. Having dislodged and distorted the teaching, he then offered a fanciful updating of the courtly love of medieval days, calling it the "Fifth Way." Mouravieff, an exiled aristocrat, had the typical sense of superiority over Russian émigrés he presumed to be socially inferior, especially someone like Ouspensky who felt he "was not protected inwardly, by this precious armor which is the scientific method. Everything in him was wavering, therefore open to exterior influences." [Emphasis added.] Interestingly, this unscientific Ouspensky in his New Model of the Universe, cogently and critically discusses the views of Darwin and Einstein, both of which he rejected at a time when the world was completely entranced with these theories. Ouspensky's was a rare nature, supremely rational, scientific yet artistic, mystical. Formidable as his intellect was, he was open to feeling and intuition, and so was able to penetrate beyond what he called "the thin film of false reality" of ordinary life. Though certainly many levels above Ouspensky in terms of class and education, Mouravieffas esotericist, thinker and writerwas simply not on Ouspensky's level. Even a cursory comparison of the writings of both men shows a verbiage and a lack of clarity and comprehension on the part of Mouravieff that is well below Ouspensky's. Mouravieff criticized Ouspensky's writing as having "the character of reporting conceived in the style of the 20th century, that is to say with a strong personal nuance." This, of course, is exactly what raises Ouspensky's book above so many turgid 'esoteric' tomes. Mouravieff went further, declaring: "On the whole, Fragments of an Unknown Teaching is nothing more than 'Gurdjieff as seen by Ouspensky.'" Exactly. Unwittingly, Mouravieff thus shows that his understanding of the teaching is predicated only on Ouspensky's. Also, to speak so condescendingly shows, too, how little Mouravieff appreciated the brilliance, artistry and intellectual integrity with which Ouspensky conveyed his experiences with Gurdjieff and his comprehension of the ideas. Of this Ouspensky has said: "I have written down and described how we met the system(5) and studied it. But I realized what a different impression it all produces on readers as compared to us who actually were there. A reader will never be able to find the right center of gravity.... This is why there are no text books on the system. Things can be written only for those who have studied. "(6) It should be noted that Gurdjieff, aware of the difficulty in writing such a book, praised Fragments for its objective reporting of his presentation of the teaching prior to 1923. "Very exact is," Gurdjieff said. "Good memory. Truth, was so." And, "Before I hate Ouspensky, now I love him." Mouravieff, always absolutely confident in his own interpretation, revealed a dimension of his relationship with Ouspensky he never suspected when he tells of the two dining with Baroness O.A. Rausch de Traubenberg, a friend who was helping to translate Ouspensky's book from Russian into English. The baroness's twelve-year-old son came to the table and asked that the two men write something in his album. Wrote Mouravieff: "Whatever happens in life, never lose sight of the fact that two times two make four." Wrote Ouspensky beneath Mouravieff's sentence: "Whatever happens in life, don't lose sight of the fact that two times two never make four." Ouspensky smiled, and gave Mouravieff a mischievous look. "Well!in your maxims, I recognize you perfectly, you two." "Whim?Certainly!But from the point of view that interests us for the moment [Ouspensky's attitude toward life], Ouspensky was completely there [referring to the personality, not presence]." In other words, in Mouravieff's view, Ouspensky was not scientific, not rational. Of course, Ouspensky, a real teacher in his own right, was not denying the rationality of two times two making four. Rather, he was completing Mouravieff's assertion. What he wrote took the absolutism of Mouravieff's statement (a feature of his) and reopened the statement for the baroness' son in the sense of asking where and in what cases either of the statements is right or wrong, and further, in what instances they might both apply. But what, in fact, did Mouravieff know? Did he really know Gurdjieff? Know him well enough to judge him? Did Mouravieff understand that Gurdjieff's mission was to establish the ancient teaching of The Fourth Way in the West as quickly as possible? That the world would be on the edge of destroying itself not only with nuclear weapons but most recently with the genetic engineering of life, human and otherwise? That Gurdjieff's methods sometimes were harsh because he needed to step-down the teaching if it was to take root in his own time? That he could find no one willing to be an instrument of the teaching, no one who could capably be "a helper-instructor"? Gurdjieff's car crash proved he was not outside the Law of Accident. (1) That Ouspensky had known Mouravieff before Constantinople is unclear. Twelve years younger than Ouspensky, Mouravieff was born in Kronstadt, the naval base at St. Petersburg, and was raised and educated in St. Petersburg. Given his interest in esoteric subjects, he might have met Ouspensky at the Theosophical Society, or possibly Mouravieff attended one of Ouspensky's public lectures at the Duma. What seems more certain is that they did not meet at bohemian clubs that Ouspensky frequented, like The Stray Dog, for Mouravieff's father was Graf Piotr Petrovitch Mouravieff, admiral of the Russian fleet and vice minister of the Russian navy in the last imperial government before Tsar Nicholas II's abdication. Mouravieff himself was Prime Minister Kerensky's principal private secretary during Kerensky's service as the second prime minister of the new Russian Republic. (2) Boris Mouravieff, "Ouspensky, Gurdjieff and Fragments of an Unknown Teaching," Revue Synthèses, #138, 1957. All quotes by Mouravieff, unless otherwise indicated, derive from this article. (3) Had Ouspensky published the book, it seems clear from Gurdjieff's later praise of it that it would have created the bridge with which the two men might have reconciled, either then or when Ouspensky returned to England from America in January 1947. Its publication would also have provided the teaching with a much needed impetus. So Mouravieff supplied a negative critical influence that had deep repercussions. (4) It is interesting to note Mouravieff's sentence construction and usage of "this was not a stalwart man" [emphasis added] in which he uses the impersonal; this was to raise himself above and distance himself from his subject. (5) An important distinction indicative of levels of understanding. Ouspensky and Mouravieff refer to the system, whereas Gurdjieff speaks of the teaching, as in "The teaching whose theory is here being sent forth...." Search, p. 286. In Ouspensky's The Fourth Way, p. 400, he reported: "In the beginning in Russia Mr. Gurdjieff always insisted that it [the teaching] was not a system." (6) P. D. Ouspensky, A Record of Meetings, pp. 11819. (7) Fritz Peters, Gurdjieff Remembered (Samuel Weiser, 1971), p. 160. (8) G. I. Gurdjieff, Life Is Real Only Then, When "I Am" (E. P. Dutton, 1978), p. 25. (9) G. I. Gurdjieff, The Herald of Coming Good (Sure Fire Press, 1988), p. 64.